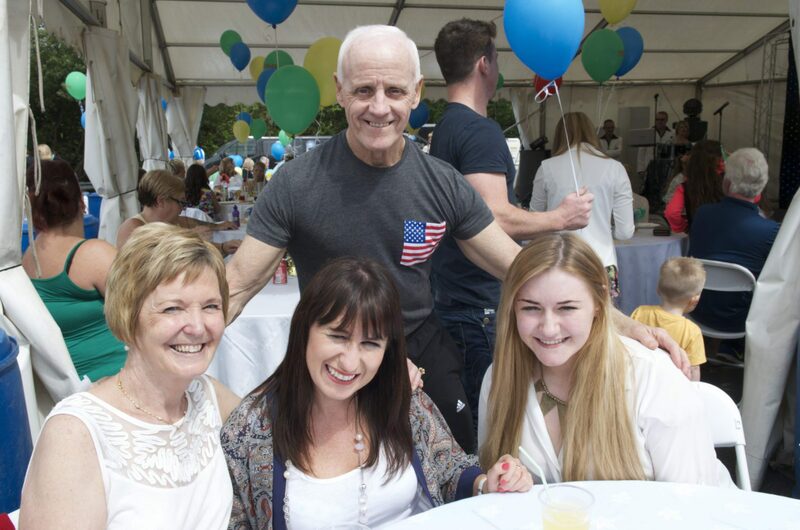 Hundreds of people turned out to soak up the sunshine, entertainment, BBQ and free fun events at Pro-Life in Paisley to celebrate the launch of Renfrewshire Sports Charity. There was a wonderful party atmosphere as young boys and girls got the chance to try their skills at water zorbing, beat-the-bull and keepie up as well as being entertained by Bubbles the Clown and having their faces painted. The two bouncy castles were a huge hit and there was also a free Rockettes workshop where young fans of the cheerleading group got a chance to learn some new moves. Adults got into the beat with a variety of acts and music from Entertainment Express while the burger stall, barbeque and free buffet kept hungry visitors satisfied. The RSC team has been up since dawn preparing for the debut event and every minute spent preparing proved worthwhile. There were happy faces all round. During the celebrations businessman Alex Whelan took to the stage to explain why he had gifted the Pro-Life gym to the charity and urged everyone to back their efforts as he took a back seat. Every new membership will mean £400 for the hospices. There were loud cheers and claps after both Helen Simpson, chief executive at ACCORD and Kate Lennon, chief executive at St Vincent’s spoke to the crowds about the work of the hospices and hopes for the future. Helen told the crowd she spoke for both hospices when she said what a wonderful gentleman Alex was – humble and kind and truly unique in giving such a gift to help people with life limiting illnesses. Kate told visitors that one woman whose husband was in the hospice was telling her how much she appreciated the support and kindness of the staff and she summed up her experience by saying ‘Coming here is like having a big pair of arms wrapped around you’ . Two special plaques were awarded to Linwood Rangers and Saltire Boxing Club by Ian Lynchahon, chairman of SportRenfrewshire in appreciation of all their work in the community over a number of years. Babs McGinlay, 55, a Buddie who moved to Canada 30 years ago was back in her home town on holiday and decided to visit the open day after friends told her the story of how the hospices benefit from gym memberships. Gayle Brannigan, chief executive of Renfrewshire’s newest charity, said: “We wanted people to come along and enjoy themselves. It was our way of saying thanks to those who support the charity through Pro-Life because every membership means money for ACCORD and St Vincent’s. “We issued an open invitation to the whole community to come along and the turnout was magnificent. We had a fabulous crowd and we also had the chance to shout out loud and proud about what we want to achieve for our two hospices as well as highlight what we want to do for our promising young sportsmen and women. “The team at RSC will be working hard to raise hundreds of thousands of pounds for the hospices but we can’t do it alone. We need the support of the community and if the open day is anything to go by we have their blessing.